Humanity’s understanding of number was deeper and richer when the concept of creation was rooted in direct experience. But modern sensibility favors knowledge based exclusively on physical laws. We have forgotten what our ancestors once knew: that numbers and their properties create the forms of the world. Ancient units of measurement held within them the secrets of cosmic proportion and alignment that are hidden by the arbitrary decimal units of modern mathematical thinking. Sacred numbers arose from ancient man’s observations of the heavens. Just as base ten numbers relate to the fingers and toes in terms of counting, each celestial period divides into the others like fingers revealing the base numbers of planetary creation. This ancient system made the art of counting a sacramental art, its units being given spiritual meanings beyond just measurement. The imperial yard, for example, retains a direct relationship to the Equator, the length of a day and a year, and the angular values of Earth, Moon, and Jupiter. The ancients encoded their secret knowledge of the skies within mythology, music, monuments, and units of sacred measurement. They understood that the ripeness of the natural world is the perfection of ratio and realized that the planetary environment--and time itself--is a creation of number. The problem facing a culture that wants to measure Heaven and Earth is that there is no real connection between the two. On Earth, something has length. In the sky, everything is an angle. For the centuries we term the Dark Ages, this fact was given as a reason for why what was up there could not possibly be related to what was down here--a doctrine that suited the Church. The only part of the Earth that clearly relates to time is the equator, since in the course of a sidereal day, relative to the stars, the Earth rotates exactly once. While planets, Sun and stars come and go as the Earth turns, that turning motion equates to the distance traveled by a point on the Earth’s surface. This means that angles can become distances to represent time on Earth. We can consider a simple example of how the circumference of the Earth can connect length and sky time. At the equator this rounds down to 43,800,000 yards in one tropical day, if we can accept that the Imperial yard has reached us with an accuracy of 99.94% of this value. If the ancient yard was an exact subdivision of an ancient measurement of Earth circumference then this level of error is quite possible in either the measurement and/or as the unit has reached us from the past. Now, if 43,800,000 yards is divided by 365 we obtain the distance moved at the equator during one Chronon, which is 120,000 yards or 12 times 10,000, also a highly significant 360,000 feet. Previous chapters have shown that the numbers 365 and 10,000 are ubiquitous in the system of time related to Jupiter and the Moon, and the number 12 is of further interest for it will ultimately provide us with 12 inches in a foot. Using this system of measures, the average single degree along the circumference equals 365,000 feet, connecting angular measure with length. If the 120,000 yard Chronon distance is now further divided by 10,000 (a myriad) and then by 12, we obtain the yard. The equator of any planet can, of course, be divided by 365 to yield 365 equal parts, and this result can then be divided once more by 120,000 to define an arbitrary unit of length. However, in the case of the Earth the revealed unit is not arbitrary, and is currently in use as one Imperial Yard, on a planet that has 365 days in a Practical Year, 365 Chronons in one rotation and 10,000 Chronons in a sidereal month! So, the circumference of the Earth and the orbital behavior of the Earth and Moon are implicit within every Imperial yard and consequently every structure built using it. Similarly, the recently outlawed Imperial foot is shown to have a fine pedigree based on geometry, the measuring of the Earth. Imperial units can now integrate any astronomical time relation within a physical structure on the surface of the Earth. In particular the English yard and its foot become supreme measures allowing access to the ancient metrology. As John Neal makes clear in his remarkable book All Done with Mirrors, the oldest surviving standard rod in Britain is the yard, now in the Westgate Museum in Winchester. Dating from before 1000 A.D., it is just 0.04 of an inch short of the modern Imperial yard. The metric system of units has no such affinity with the Earth, causing Napolean, its apparent champion, to refer to it as trivial. Other interesting numbers and units develop from this simple example. If we assume a natural rounding up to 25,000 miles around the equator at some time in the past, a mile would then become 5,256 feet (1752 yards) and not 5,280 feet (1,760 yards). And a unit of 365 yards would surely have been used, further defining the Imperial yard in this example. Since it is a type of furlong (220 yards), we would appropriately name it the Yurlong. It is important to question the credentials of the Greeks, Egyptians, Babylonians, the Sumerians before them, and of course the ancient Britons. Did these cultures really measure the size of the Earth and define systems of weights and measure inherited, like the 7-day week, from the prehistoric world? In the pre-literate world we may only answer that question by investigating how well our legacy of measures fits the known size of the Earth. But there is another hefty clue, from the texts of a first century Greek writer. Close to the end of the second volume of his Natural History, Pliny writes at length on the distances between cities of the known world together with the various estimates of the Earth’s dimensions. He gives 42,000 stades as the length of the polar radius, which is 3949.7142 miles. For a civilization decidedly low-tech by our modern standards, this figure compares very well with David Clarke’s 1886 survey value of 3949.573 miles, and the Encyclopedia Britannica’s quoted value of 3949.921 miles. Pliny also takes a circuitous route to the equatorial radius, suggesting 3963.5 miles, a figure just a quarter of a mile more than the modern figure. How did Pliny get his hands on such an accurate figure? Who did the original measurement and how? At this point, we might usefully point out that Clarke’s survey was undertaken before satellites and GPS navigation, and basically relied on the accurate measurement of angles between an accurate base length, together with the sine rule of basic trigonometry, a rule inscribed on Sumerian clay tablets by a culture noted for its accurate measurement of angles. Weights and measures--that is, metrology--relate to the work of the smith in the developing ages of metal, but why, around 3000 B.C. did it become so imperative to measure Heaven and Earth so precisely? "Heath brings the Cosmos back to Earth, demonstrating that the sacred ratios were incorporated into ancient architecture such as Stonehenge and reflected in the musical tones that the ancients sounded to plug into the Divine." ". 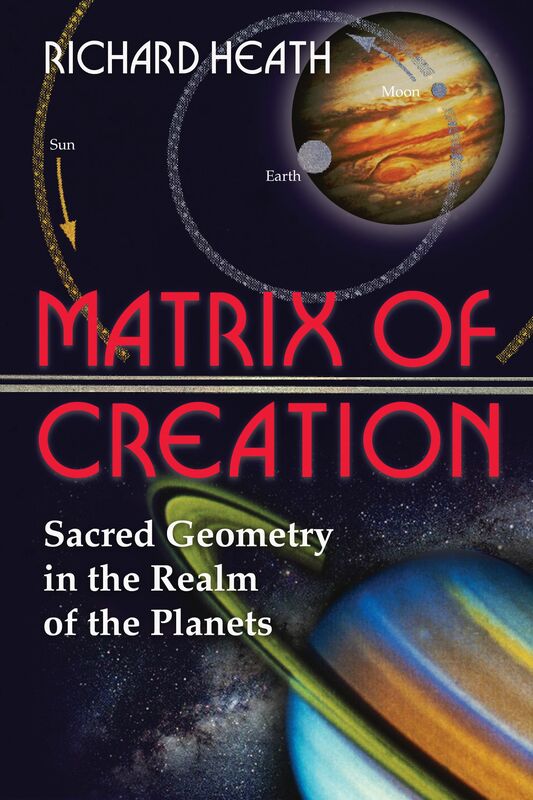 . . a concise exploration of the cosmos that will appeal to mathematically oriented students of metaphysics."